As a lawn maintenance business, you need to be generating new leads regularly. Aside from keeping your current customers happy with the services you provide, you need to be able to create business. Most lawn maintenance businesses won’t have a large marketing budget or even a budget set aside for marketing at all. While you might feel that this could hinder your business, there are the tools and means to get your marketing engine revving and turning up new customers regularly. 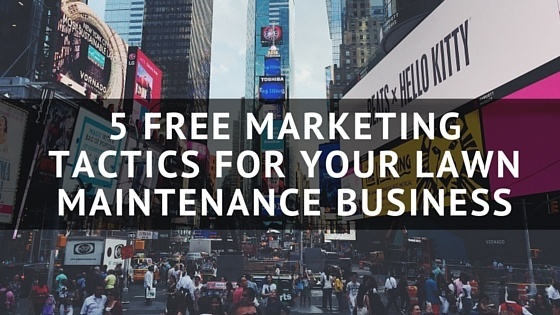 Here are five free tools and tactics that you should be using to boost your marketing immediately. We’ve written about the powers of blogging for your field service website before. Seriously, blogging is a very powerful marketing tool that only costs you time. If you already have a website, you most likely will be able to host a blog for free. While the word “blog” might conjure up images of people sharing baking recipes or video game enthusiasts with too much time on their hands, many of those people are actually making very real money because of the powers of blogging. As a lawn maintenance business, you have the ability to boost your search engine optimization for your website and you can show potential customers that you are an expert in your field. A blog is a great place to write about lawn maintenance topics in your geographic location, such as watering practices or when to plant grass seed at the start of the season. Writing about relevant topics to the green industry can help increase your search engine rankings for search terms that buyers use. While social media might not excite many lawn maintenance professionals, it can have very real results. It is a great way for you to connect with existing customers and can act as a very effective market research method. While there aren’t many green industry social media accounts that use the platforms effectively for their marketing efforts, there are a few that are spot on with their accounts. @Centsablelawns, a lawn maintenance and landscaping company out of New York does a wonderful job of posting relevant, useful content to their Twitter and other social media accounts. The major social media platforms are free for businesses to use and create profiles and pages. Make sure that you complete your information, such as name, address, phone number and website consistently across all of your profiles. Each year that we perform the Green Industry Benchmark Report survey of hundreds of green industry professionals, we have seen that referrals are the most common form of new lead generation for the businesses we speak with. While the saying “don’t fix what ain’t broke” might be the mindset here, why not take it a step further and make your referral process even more powerful? Actively asking for referrals doesn’t cost anything. It might require you to form a new habit when speaking with customers and it might also take a little time in the office when you’re sending out your regular emails. Asking for referrals won’t cost you anything, but it has potential to be a great lead generator. Have a way to collect email addresses on your website. A simple “learn more” form on your site can be incredibly helpful in building an email list of potentially interested visitors. If you have someone call into your office that would like to receive a quote on lawn maintenance, try to collect their email address as well. Even if they don’t plan on purchasing from you, you can keep them in your email database(as long as they consent) and you can email them regularly. There are also free emailing tools, such as MailChimp, that you can easily create and send professional looking emails complete with your company logo, pictures and more. An emailing platform will also give you insight as to what emails perform well and when an email is opened and clicked on. Another great way to market your lawn maintenance business for free is to partner with businesses or causes in your area. Sponsor a portion of a highway, provide lawn care for a charity event or organize a volunteer event with your employees. Getting out in the community will get you recognized and can be great way to market your business at no cost, other than your time. 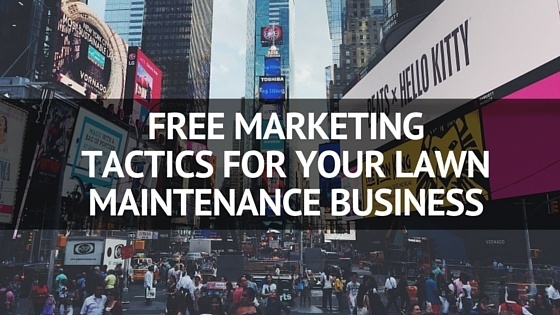 Want a few more marketing tips for your lawn maintenance business? Download the free eBook, Local SEO for Green Industry Businesses today!